Spending a day in jail has some social scientific value for the temporarily detained; it enables a closer, albeit short-lived, look at the systems of policing and criminal justice. And because I often expend much time on this blog railing against the excesses of the New York City Police Department, it makes especial sense for me to offer a few observations on my interactions with them on Tuesday last. First, the arrest itself. The NYPD was scrupulous about providing warnings to those that lay down on Second Avenue; we were told that we were obstructing traffic and had to clear the intersection, failing which we would be arrested. We were not immediately bum-rushed. After the warning was repeated, and those who did not want to court arrest had moved out, the police moved in. I was hauled to my feet but I was not treated roughly. The handcuffs placed on my wrists–the plastic variety–were painful, and a couple of tightening tugs made them more so. The arresting officer then placed his fingers through their central loop, making them even more painful. I told him I had no intention of absconding, as I had deliberately courted arrest; he replied he had to follow arresting procedures. Fair enough. We were then bundled into the wagon, un-seatbelted, and thus susceptible to being thrown around, forward and backwards, when the wagon braked or took corners. The driver of the wagon thankfully opened the doors when we arrived at the precinct, and assured us he had turned on the A/C, but it hadn’t worked, thus leaving us sweltering. I believe him; he sounded sincerely apologetic for any discomfort caused to us. I had been a little nervous about the arrest because I did not want to get shoved around or slammed to the sidewalk, but none of that occurred. There was no animosity directed at the police by the protesters and the police seemed more bemused than anything else by our doings. Second, my booking at the precinct. The central irony of the precinct–as Corey Robin and I both noted in our conversation after we had been released–is that while it is a zone of legal enforcement, it feels, and very often is, a lawless zone. You come face to face to unblinking, resolute bureaucracy, beholden to its procedures, and their utter rigidity, all the while knowing that the police can stretch and violate them with impunity. The incarcerated are always aware that they are powerless, that the police can exert all manner of power over them. You might seek redress later, but that will not, in any way, diminish the terrifying powerlessness when a policeman got in your face, or pushed you, or otherwise abused you in any other way. There is also the depressing empirical fact that the long arm of the law rarely reaches out to accost a policeman. You are at the policeman’s mercy. Questions may be treated with a blank stare or a noncommittal reply, and very little helpful clarification about procedure is offered. It is here that you most sense a figurative forcing of you to your knees. The swagger, the cockiness, the brusqueness of the cop; these are all external manifestations of the confidence they posses in their imperviousness to any forms of pleading or redressal. My imprisonment was exceedingly brief; I only suffered minimal discomfort (one of my fingers is still slightly numb). I am privileged and lucky. Many others who deal with the police and the penal system are not. There must be some sort of writer’s law out there that captures the sensation I am about to describe: as your book approaches the finish line, and as the final proofreadings, corrections, indexing queries, and debates about jacket and cover compositions pile up, the author’s nausea at the sight of his former ‘dearly beloved’ increases in direct proportion. [C]opy-editing is hard, tedious work, of course, leaving behind many a scar worn in by memories of endless, iterative checks. That moment is upon me again. 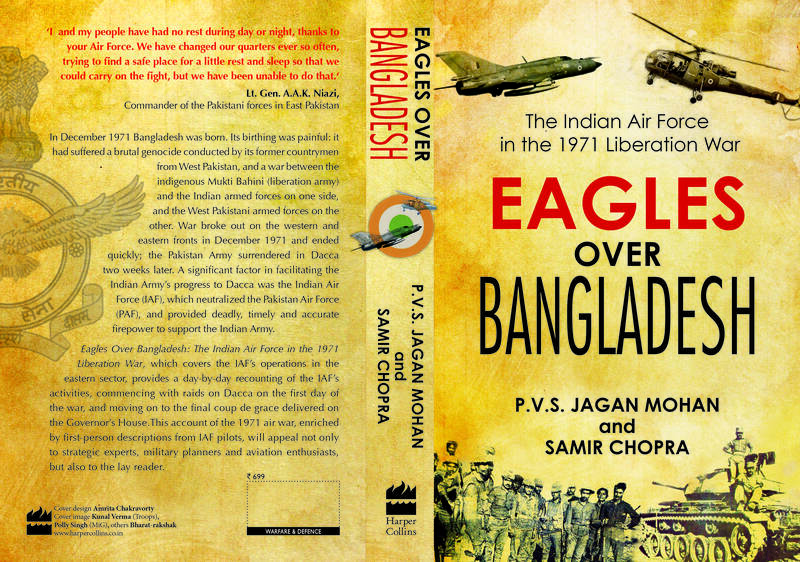 My co-author, PVS Jagan Mohan, and I are now getting close to the final production stages of the first volume of our history of the air war component of the 1971 Liberation War for Bangladesh. (This is the second book we have worked on together; the first was a one-volume history of the 1965 air war between India and Pakistan). The book has been eight years in the making and I can’t wait for it to be over. The lion’s share of the work has been done by Jagan, but I’m still exhausted. I can’t imagine how he feels. Nothing makes copy-editing and proofreading less tedious. This morning, I have played classical music and electronica as sonic accompaniment; they offer only partial solace; they won’t do the reading and corrections for me; they won’t make the act of reading these four hundred odd pages for the umpteenth time any easier. I have, of course, sought relief in distraction: perhaps Facebook, perhaps Twitter, perhaps more sensibly, a little play-time with my little daughter. Somewhere in the distance, because of the presence of the PDF file of the final proofs resident on my desktop, I can sense the final finished product: a slick paperback with an artfully designed cover, my name on its spine. But it’s still distant, and I feel overcome, again, by a curious mix of tedium and anxiety. This thing, this beast, is supposedly a virtual intangible thing, an electronic file. But as I crawl toward the finish, it weighs on me like something far more corporeal.